We have taken numerous day trips, a few weekend adventures and are adding some longer adventures to our travel list. But no matter what, we always do some sort of planning prior to taking off. I've gotten a few questions from friends about how we go about planning our trips so I figured I'd throw a post together. So here is your (disjointed) guide in planning a trip with a toddler! When we first got to Spain, we wrote down our top five travel destinations within Europe -- where we for sure want to go before we leave Europe. Trevor and I actually did this separately but surprisingly most were the same! We also wrote down a top five list for Spain as well given that these destinations were slightly easier to get to for us and we want to explore this gorgeous new country of ours. So, with these places in mind, we get to our planning. Day Trips -- we usually pick towns 1-2 hours a away and go from there, a lot of word of mouth from friends who have taken day trips, use a few Facebook groups, and we use this book that has great day trips from our town (I have heard good things about this book too) -- both are older so keep that in mind. Our day trips are pretty relaxed, but we do at least read up on where we are going and where to park! Longer Trips -- for places we fly to, we often use Skyscanner to look for flights. It's a great website to look at the airport you want to fly out of and then find cheap places to fly to by using the "everywhere" function -- and you can look at flexible dates too which allows us to travel fairly inexpensively. While we use Skyscanner to search flights, we always book directly through the airlines since they often have less restrictions than using secondary sights. In terms of actually picking a place to go, we attempt to cross places off of our list, but also look at the time of year and what is happening -- we purposely chose to go to Germany in December to see the Christmas markets, but our dates were flexible so we looked for cheaper dates to fly. And we try to do more of our traveling in the spring/fall because its often cheaper. Of course we have tried to do more traveling before Serafina turns two and we have to pay full fare for her (budget airlines charge a flat fee of $20-40 per flight for a lap infant). And finally look at the fees associated with your tickets. There are tons of budget airlines in Europe and all have varying rules for their extra stuff. A €20 ticket sounds amazing, but look at the fine print. Some airlines allow for free child gear and some don't. All of them charge for bags, seats and priority boarding -- with a toddler I definitely recommend getting seats and priority boarding, it just helps with the craziness of flying. But also look at the non-budget airlines. When we flew to Germany, it ended up being cheaper to fly with Luftansa (bags, seats were included) rather than flying a budget airline. We actually often book our accommodations last after figuring out the town/city's layout, transportation and the various activities we want to do. But when looking for accommodations, we tend to have an idea of how much we want to pay and then go from there. Obviously some cities are going to be more expensive than others so we usually do a quick search to figure out the average price. We use a combination of hotels.com (nice because you can get one night free after collecting ten nights within a year) and also Air BnB. Both have their pros and cons -- we tend to like apartment-hotels the best because you get the convenience of a hotel but also have a kitchette which allows us to cook a simple dinner or keep food easily (plus it means we go to the local grocery store which I absolutely love doing in a foreign city). Some things we always look for when booking places to stay: free wifi, close to the sights we want to see, ease of getting to and from with the public transportation, the neighborhood, free breakfast (if we aren't staying at an apartment), family friendly and then we also read reviews and the fine print. This one gets a little tricky because there are a lot of factors involved (and really only applies to the longer trips). We've taken a variety of transportation to get various cities and once in our destination, we've also used a variety of transportation. In Ireland we rented a car but also made sure to stay close to a train that could take us into Dublin one day. In Madrid, we used the train to get there and then only used the subway once, the rest of the time we walked. 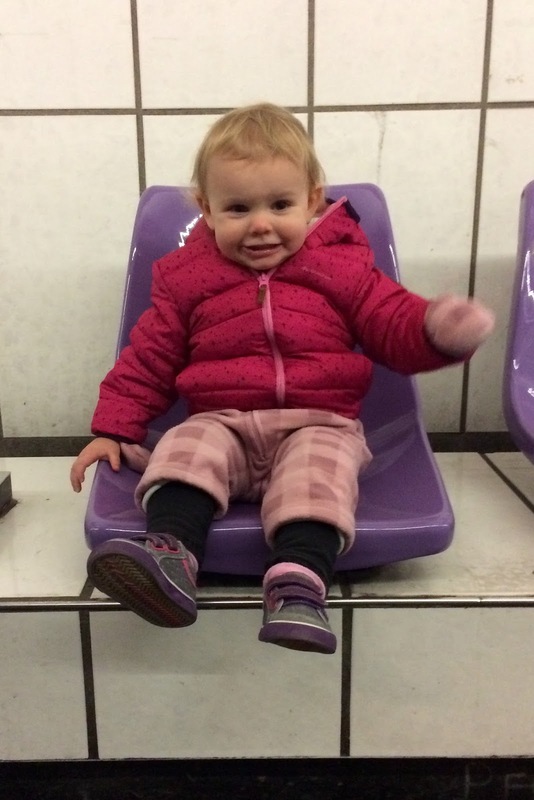 Germany was a bit of a disaster, but we took trains, subway and trams -- and we learned a valuable lesson: trains and toddlers actually don't work out so well. Without any luggage, trains and toddlers work great, but when you are carrying luggage and dealing with a toddler, not so fun. So, after Germany we decided that our next multi-city trip, it would be best to rent a car -- and actually probably more cost effective. Renting a car in Europe can be done fairly inexpensively, especially if you go with a European company and go in the off season. While train travel can be amazing, it can also be expensive, especially in countries where trains are a very efficient way to travel. If you're driving, make sure you find a place to stay that has parking available (preferably free parking) and look into bringing your car seat (or renting one). Then the fun part -- figuring out what you want to do in the cool new countries and cities you are visiting! With a toddler, it helps to plan and know what you want to do, but not over plan because, well, you have a toddler! We use a combination of Rick Steves and Lonely Planet for travel guides. Rick is great for in-depth guides to popular cities -- we often read his museum guides or city walks the night before so we have an idea of what we are seeing (since reading a guide book with a toddler running around don't always go hand in hand). The downside to Rick is that he really only shares places and cities that he likes and they tend to be more popular. And this is where Lonely Planet comes in! Their books are huge and don't always go in-depth, but they do cover more cities which has been pretty helpful for us in Spain as we tend to go to the more obscure, tiny towns on our road trips. We have learned (the hard way) that it is best to have an idea of what you want to do/see each day. This includes: where places are located (and how to get there), hours (and the best time to go) and if you can figure out how toddler friendly the place is (can you take a stroller or is a carrier needed) and also some simple places to eat. For us this means we usually have a spreadsheet or simple written down information so that when the toddler is crazy, hungry and tantruming -- we don't lose our cool too :) Nothing is worse than being in a foreign country totally clueless with a not so happy toddler. If we already have an idea of what and where we want/need to go it makes things a little easier. We always plan our must-do activities in the morning while attempting to leave the afternoon free. With a toddler, we are always up in the morning so we can typically make it to museums and other places at opening time. And our mornings are typically better before full-on toddler melt downs occur once our Peanut is so O.V.E.R being carted around to various places. We do our best to do activities in the morning that Trevor and I want to do, head back to where we are staying for a nap or a break and then attempt an activity for the afternoon that is more child friendly -- parks, kids museum, walking around, etc. And that's it! It sounds like a lot of work, and it is -- but for me, it is also a lot of fun -- I love learning about the places we plan to visit and the things we will get to see and planning out our days. And when you've done all this planning -- BE FLEXIBLE! Things never go according to plan, even if you don't have a toddler in tow, so be flexible and you'll have a blast!